Is ‘Saving Lives at Sea’ still a Priority for the EU? Saving the lives of refugees and other migrants has been reiterated as a number one priority within the European Agenda on Migration. This document puts ‘saving lives at sea’ above fighting migrant smuggling, relocation and resettlement, stating that ‘Europe cannot stand by whilst lives are being lost.’  This timely and solemn declaration was made by the Commission on behalf of the European Union. But is ‘saving lives at sea’ only of declarative value, or was the EU really heading towards a new commitment to humanitarianism at sea? And most important, is it still the case? An inconvenient truth is that the death rate of those crossing the sea has increased more than nine times (Figure 1) since 2015. Meanwhile, EU policy makers and EU agencies showcase the drop in the absolute numbers of deaths as a victory or as evidence that they are delivering on the European Agenda on Migration. Indeed, the absolute number of individuals dying in the Mediterranean has dropped (Figure 2) from 3,771 in 2015 to 486 in 2018, though this number better correlates with an overall reduced number of sea crossings (Figure 3). From the statistics we can see a paradox. Although the number of sea crossings decreased, the death rate is increasing in an unprecedented way. In 2015, four persons would be reported as dead or missing out of 1,000 trying to cross the sea. Three years after the aforementioned solemn declaration which came with substantial additional funding for the relevant EU agencies and their operations in the Mediterranean, already, 37 lives were lost per 1,000 sea crossings. Such a simple arithmetic exercise is hardly seen in any reports of relevant EU agencies, begging the question, why? And what is (not) being done about it? Note: * 2018 data as of 23 March 2018. Source: UNHCR, “Mediterranean situation”, as of 23 March 2018 (http://data2.unhcr.org/en/situations/mediterranean). How is the EU measuring ‘success’? This is an important question, because ‘success’ may mean different things to different actors. If we are serious about the EU’s priority of ‘saving lives at sea’, can absolute reduced numbers of reported migrant deaths be an indication of a successful intervention? Here parallels would help. For example, in the other regrettable area of statistics on child mortality, would this hold? International institutions and agencies, such as the World Bank showcase statistics of infant mortality rates, counting numbers of occurrences per 1,000 live births. It is logical that various donors (including the EU) would be looking at the changes in the death rate rather than absolute number. They know too well, that while the total number of infant deaths can be declining, for example, if there are simply less births taking place. In a meantime, the death rates may remain the same or increasing, if necessary maternal health and other services are still underdeveloped or not affordable to many. Therefore, death rates should be the key indicator if we are serious about having any positive results on ‘saving lives at sea’ rather than ‘window dressing’ other underlying political priorities. Was saving lives ever a ‘serious priority’? The Italian Mare Nostrum operation proved that if there is a political will, there is a way. 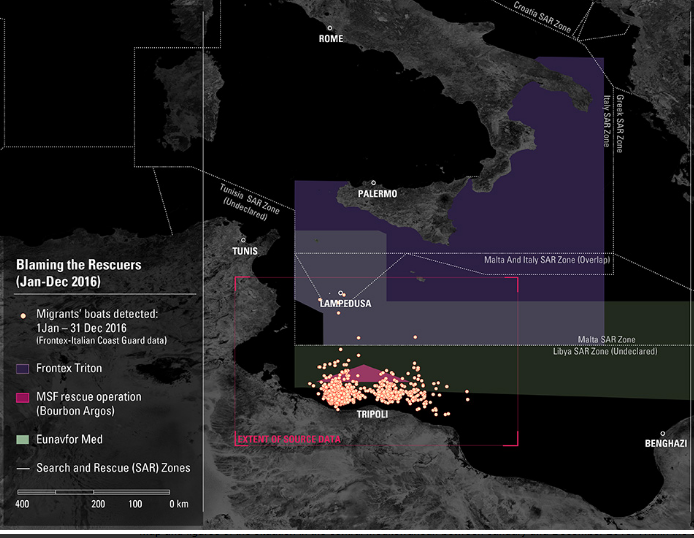 The Italian navy was entrusted to run the first truly humanitarian operation - search and rescue being its core activity. Mare Nostrum proved to be efficient in saving lives, as it helped 150 thousand refugees and other migrants to reach safety. The death rate at that time was four persons per 1000 crossings. In order to replace Mare Nostrum, the EU leaders have enhanced two European Patrol Network Operations, Poseidon in the Aegean and Triton in the Central Mediterranean, and a military operation, EUNAVFOR MED Operation Sophia. Operation Triton was re-baptised in February 2018 Operation Themis, with one main change – not having automatic authorisation to disembark saved refugees and other migrants in Italy. None of these operations have search and rescue as their primary goal, thus none of them has actually replaced Mare Nostrum. Rescuing obligations arises for the EU-funded operations under international maritime law, as for any other vessel at the high seas, such as cargo or merchant ships. Though, unlike for other vessels in the high seas, their budgets were increased for precisely this purpose – ‘to save lives’. The EU operations at sea have increasingly focused on combating migrant smuggling. This has led to clashes with civil society actors who do proactive search-and-rescue, as to fill-in the gap left after the end of the Mare Nostrum operation. The NGOs became easy targets for accusations of being a ‘pull-factor’ (similar accusations were earlier directed at Mare Nostrum). 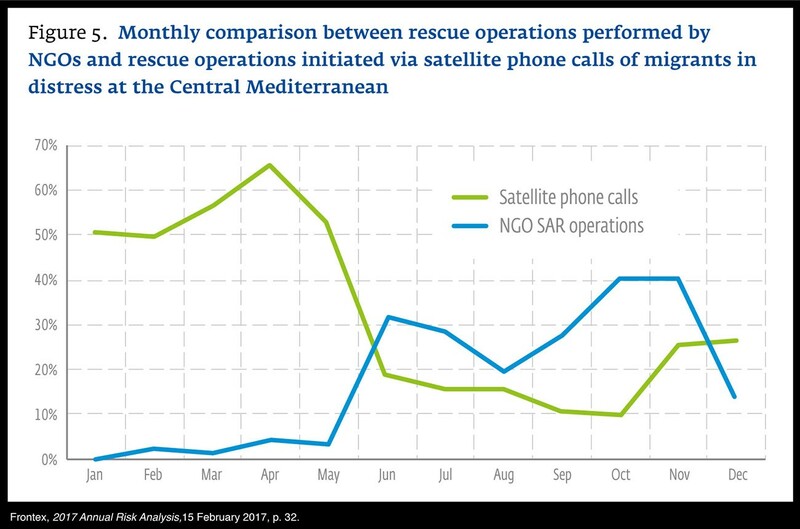 Source: Frontex (2017) Annual Risk Analysis (for 2016), 15 February 2017, p. 32. The IOM’s Missing Migrants project has been another attempt to provide more nuanced statistics on saving lives in the Mediterranean and to measure the average death rate per incident. Though the number of deaths does not correspond with those of the UNHCR as only ‘migrant fatalities’ are recorded, excluding missing migrants (see table 1). These numbers give the impression that death rates per incident have decreased. The reduced fatalities per incident could also be assigned to NGOs that were patrolling closer to the places of incidents, than European operations (see figure 5). The proximity to incidents though, was one of the main arguments to accuse such organisations of being ‘migrant taxis’. Source: IOM’s Missing Migrants Project, 2017, (https://reliefweb.int/sites/reliefweb.int/files/resources/C%20Med%20fatalities%20briefing%20July%202017.pdf). Source: Forensic Oceanography (2017) Report “Blaming Rescuers” by Charles Heller and Lorenzo Pezzani, was produced as part of the Forensic Architecture agency at Goldsmiths (University of London). (https://blamingtherescuers.org/). In August 2017, the Jugend Rettet ship Iuventa was confiscated and criminal investigations were opened by the prosecutor of Trapani. Recently, a ship of Proactiva Open Arms was also seized as of 18 March 2018. Such mix of suspicion, uncertainty and hostility, led to a withdrawal of the majority of organisations from the Central Mediterranean leaving only three to operate today. Though, the ones that are remaining - are experiencing immense pressures to go against their ethos,  including handing over rescued persons to the Libyan authorities, in violation with international law. Blaming and criminalising rescuers thus became another strategy illustrating that the EU’s underlying priority was to prevent the arrival of refugees and other migrants. Noble cause of ‘saving lives at sea’ was rather used to package it better before EU citizens. In the past, the boats used to arrive at Italian territory, now most boats which set sail are not even equipped to arrive at international waters – trips have become increasingly more insecure and risky. 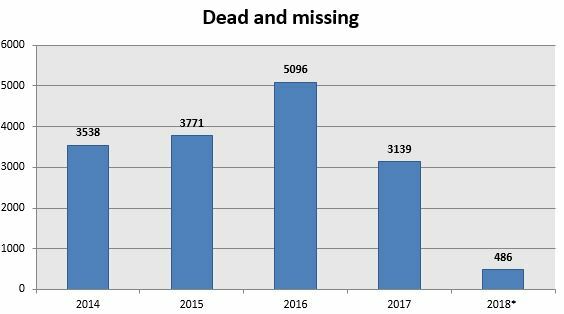 The absolute numbers as well as the rate of dead and missing people in the Central Mediterranean from 2015 to 2016 has almost doubled according to the UNHCR statistics. The explanations of this phenomenon of increasingly deadly routes have been often oversimplified by some actors who blame the proximity of the NGO’s activities. Frontex risk analysis acknowledges that less and less wooden boats depart from Libya,  but Frontex does not identify it in any way as a factor causing more incidents closer to Libya’s shores. Thus, responsibility for the incidents and overall ‘increased number of irregular migrants departing from Libya’ is shifted to the NGO SAR activities. Thus, such risk analysis does not (aim to) provide a holistic picture and to change the situation in the countries of origin and conflict-torn Libya itself. The UK’s House of Lords annual assessment of Operation Sophia reached the conclusion that ‘an unintended consequence of Operation Sophia’s destruction of vessels has been that the smugglers have adapted, sending migrants to sea in unseaworthy vessels, leading to an increase in deaths’. A similar conclusion was reached by the ‘Blaming Rescuers’ report. Though, again structural problems, such as lack of legal and safe ways to reach Europe, need to be put back into the picture. The precedent was set and soon such victories were taken at any costs, including by making deals outside of the EU and national law, even including bribing various militias in Libya. The Italian Minister of Interior, though in the beginning trying to hide the usage of lush funds to bribe Libyan militias,  eventually has openly defended such methods as they ‘led to 87% drop in migrants from Libya’. Thus, it is no longer clear what comes first – the lives of refugees and other migrants or their absence? ‘Realistic solutions’ or ‘lightness of leadership’? The ‘realism’ of current policy approaches is not only ‘not perfect’ but also very ‘short-termistic’. Indeed, Italy’s deals with Libyan militias, the EU-Turkey Statement with an increasingly authoritarian regime, are already starting to show its ‘long-term’ deficiencies. Namely, that the lack of democratic accountability in both processes carries a price-tag for externalising the EU’s and its Member State’s international obligations over persons in need of humanitarian protection and decent living conditions. While making ‘deals’ Libya as well as with Turkey, EU pressures to tackle migration have grown at the expense of the fundamental rights and lives of refugees and other migrants. The focus has been redirected from institution building and Rule of Law in these countries to the strengthening of various actors with financial and material support. In the case of Libya, these actors were ‘militias’ acting outside of and challenging the already fragile, internationally recognised Government of National Accord. Let’s come back to a project in a given country X. Now let’s imagine that in a country X we fund a project that has been created to prevent child mortality. The funds have been tripled. However, after three years, while project officers are claiming in their reports that absolute numbers of child mortality have dropped, the mortality rates have spiked ninefold. What would we do? Obviously, such a project would be immediately stopped and carefully investigated as to whether it also had some (un)intended effects and replaced with one that is better suited for addressing the needs. We, live in interesting times, when criminals are considered to be ‘helpers’ and helpers – ‘criminals’. While the Italian Ministry of Interior is generously bribing the high rank militias involved in migrant smuggling,  actual criminal investigations are opened against helpers. The Court of Trapani was investigating not only NGO’s doing search-and-rescue, but also Eritrean Priest who was nominated for the Nobel Peace Prize. History is yet to show who, in this time of lightness of leadership, will be remembered as heroes and who were simply buying and trading the fears for their short term political goals. Whether for the EU ‘saving lives at sea’ is a priority and whether it is delivering on this priority concerns all of us. As EU citizens and as EU tax payers we indirectly support such ’interventions'. We thus have the right to demand from EU authorities and national leaders that saving human lives shall be more important than ‘stemming flows’. If not, we will lose something very precious as a society - our shared humanity’. European Commission (2015) "A European Agenda on Migration" COM(2015) 240 final, Brussels, 13.5.2015, p.2. Operation Triton as of 1st of February, 2018 replaced by Operation Themis Reuters (2018) 'In new EU sea mission, ships not obliged to bring migrants to Italy' Article by Reuters staff. February 1, 2018 (https://www.reuters.com/article/us-europe-migrants-italy/in-new-eu-sea-mission-ships-not-obliged-to-bring-migrants-to-italy-idUSKBN1FL62M). Carrera, S., V. Mitsilegas, J. Allsopp, L. Vosyliute (2018) “Policing Humanitarianism: EU Policies Against Human Smuggling and their Impact on Civil Society”, Hart Publishing, 2018. (https://www.bloomsburyprofessional.com/uk/policing-humanitarianism-9781509923014/). Flori, F. and L. Bagnoli (2017) “Accusations against Ngos at sea: what is false or misleading in that smear campaign”, May 19, 2017. (https://openmigration.org/en/analyses/accusations-against-ngos-at-sea-what-is-false-or-misleading-in-that-smear-campaign/). Though, NGOs already applied the voluntary code that these organisations themselves subscribed to. Human Rights at Sea (2017) “European Parliament: Human Rights at Sea outlines voluntary SAR NGO Code of Conduct”, Press Release, 31.03. 2017. (https://www.humanrightsatsea.org/european-parliament-human-rights-at-sea-outlines-voluntary-sar-ngo-code-of-conduct/). Frontex, Risk analysis, Q1. (http://frontex.europa.eu/assets/Publications/Risk_Analysis/FRAN_Q1_2017.pdf). Numbers within different IOM’s Missing Migrant Project also differ, see Table 3 for example in https://publications.iom.int/system/files/pdf/fatal_journeys_volume_3_part_1.pdf. Team Humanity (2018) “Danish Lifeguard fighting a battle of injustice” a Crowdfunding Campaign (https://startsomegood.com/danish-lifeguard-fighting-a-battle-of-injustice). The Independent (2017) “Charity demands return of seized rescue ship as court hearing begins”, by Samuel Osborne, on 19.09.2017. (https://www.independent.co.uk/news/world/europe/italy-refugee-rescue-ship-jugend-rettet-iuventa-libyan-smugglers-mediterranean-migrant-a7955796.html). Amnesty International (2018) “How Italy’s seizure of an NGO ship exposes Europe’s dangerous policy”, 22.03.2018. https://www.amnesty.org/en/latest/news/2018/03/how-italys-seizure-of-an-ngo-ship-exposes-europes-dangerous-policy/. Ed Sutton (2018) “Disobedient Movement,” Rescues and Repression in the Mediterranean” in Alternative Structures, Hearth & Home, Revelations” (https://antidotezine.com/2018/02/09/disobedient-movement/). Statement by 29 academics on Open Arms seizure, (http://www.statewatch.org/news/2018/mar/open-arms-statement.pdf). UNHCR (2018) https://data2.unhcr.org/en/documents/download/56289. (latest numbers available from UNHCR). Frontex, Risk Analysis, 2017 Q1, p.17. The UK’s HOUSE OF LORDS (2017) European Union Committee, “Operation Sophia: a failed mission”, 2nd Report of Session 2017–19 HL Paper 5, London, 12 July 2017, para. 45, p. 14. Forensic Oceanography (2017) Report “Blaming Rescuers” by Charles Heller and Lorenzo Pezzani, was produced as part of the Forensic Architecture agency at Goldsmiths (University of London). (https://blamingtherescuers.org/). European Parliament (2016) EU-Turkey deal on migrants: not perfect but most realistic tool to tackle crisis, Press Release, 13-04-2016. (http://www.europarl.europa.eu/news/en/press-room/20160408IPR22136/eu-turkey-deal-on-migrants-not-perfect-but-most-realistic-tool-to-tackle-crisis). The Guardian (2017) Italy's deal to stem flow of people from Libya in danger of collapse, by P. Wintour, 03.10. 2017 (https://www.theguardian.com/world/2017/oct/03/italys-deal-to-stem-flow-of-people-from-libya-in-danger-of-collapse). EurObserver (2017) The unbearable lightness of leadership, Opinion by Eugenio Ambrosi, Brussels, 18.10.2017. (https://euobserver.com/opinion/139507). DW (2017) Frontex-Director Fabrice Leggeri: 'Border control itself is not a panacea', by Astrid Prange, 19.08.2017 (http://www.dw.com/en/frontex-director-fabrice-leggeri-border-control-itself-is-not-a-panacea/a-40153595). The Guardian (2017) “EU's policy of helping Libya intercept migrants is 'inhuman', says UN”, 14.11.2017 (https://www.theguardian.com/world/2017/nov/14/eu-libya-coastguard-detention-centres-migration-mediterranean-un-zeid-raad-al-hussein). BBC (2017) Eritrean priest in Italy denies 'people smuggling', Article by Nomia Iqbal, 17.08.2017, Rome. (http://www.bbc.com/news/world-africa-40949062).